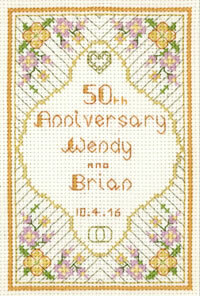 A petite cross stitch 50th wedding anniversary card kit to make a Golden wedding anniversary gift. This card celebrates 50 years of marriage. The design has a pretty garland border in yellow golds and green, with hearts, rings and ’50th’ in gold metallic thread to add pizzazz. 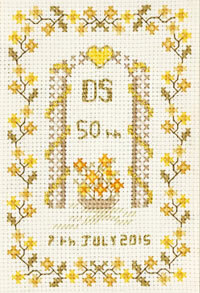 A mini 50th Anniversary card cross stitch kit for 50 years of marriage. A pretty garland border in yellow golds and green surrounds hearts, rings and ’50th’ in gold metallic thread to add pizzazz. This Golden Wedding Anniversary cross stitch greeting kit has top quality materials ~ Zweigart fabric, DMC and metallic threads, needle, card and envelope. This mini 50th Anniversary card is from the Decorative Textiles collection. 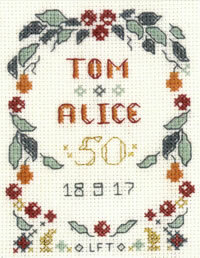 The combined collection has a great range of anniversary cross stitch cards and samplers.